How to make zucchini ribbons (or noodles)? Check out the video for the perfect technique! The ultimate summer pasta! 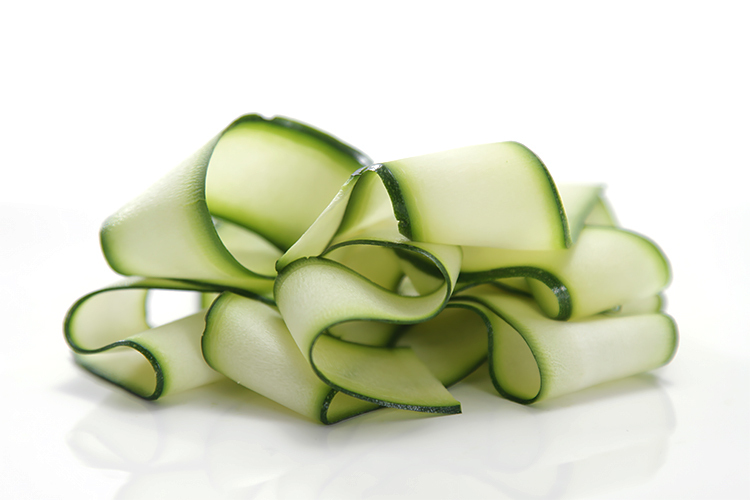 Here, young zucchini are shaved in ribbons that are the same size as the pappardelle. They don’t just add a lovely crunch to the dish; they make it so much lighter as well. The sauce is made with flash-sautéed tomatoes and pan-fried basil, which in turn bring depth and loads of flavor. 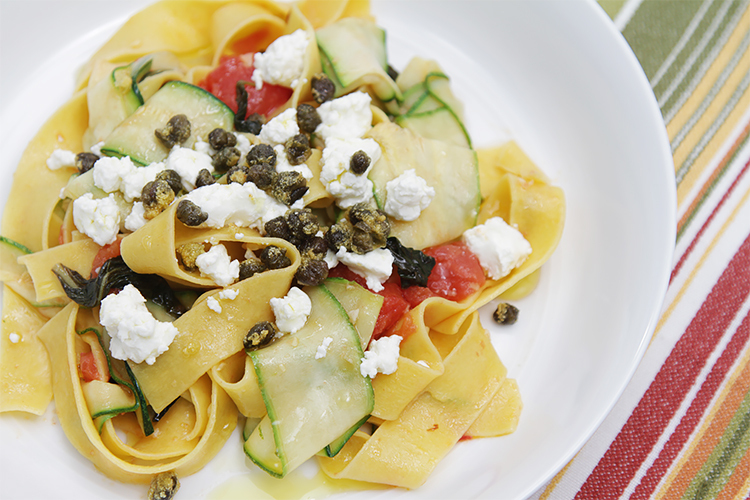 Finally, the pasta is garnished with fresh goat cheese, fried capers (irresistibly salty!) and a beautiful lemon-infused oil. Of course, if you want this dish to be truly special, make your own pappardelle using this homemade chickpea flour dough. But the recipe works just fine with store-bought pappardelle too. 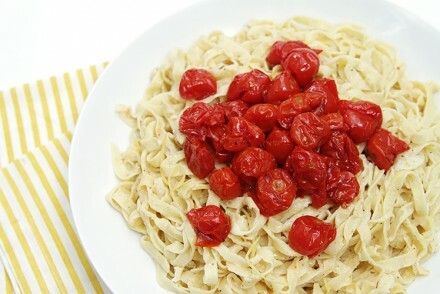 Every forkful of this pasta is light, yet richly flavored… a fiesta for the taste buds! A Sangiovese is always the first wine that comes to mind anytime cooked tomatoes are involved. But here, the zucchini, goat cheese and fried capers call for a full-bodied, luscious white wine! Pour a Chardonnay – one from a warmer region like Mâconnais or California – or a Côtes du Rhône Blanc. These wines pair well with the rich flavors of this pasta without overwhelming the delicate goat cheese and the more subtle flavor of the zucchini ribbons. Step 1: Cut both ends of the zucchini and, using a vegetable hand-peeler, slice them lengthwise into ribbons. (See video for exact technique.) Set aside or refrigerate until ready to use, for up to 12 hours. Step 2: Heat a wide heavy-bottomed skillet over medium-high heat. Add the oil, garlic, pepper flakes and basil and sauté for 2 minutes, stirring frequently, until the basil wilts and darkens slightly. Add the reserved juices and tomato pieces, stir well and sauté for an additional 4 to 5 minutes until the tomatoes start to soften, stirring only from time to time. Sprinkle with 1/2 teaspoon salt, stir well and remove pan from heat. Let the sauce stand in the pan while boiling the pasta. Step 3: Bring 6 quarts of water to a boil. When the water is boiling, add the salt and pasta. Boil pasta until al dente (for fresh pasta it’ll only take 1 to 2 minutes) and drain, reserving 1/3 cup of the water. Step 4: Return the tomatoes to the stove and heat over medium-high heat. As soon as the tomatoes sizzle, add the pasta, reserved pasta water, zucchini ribbons and balance of salt. Toss quickly and turn off the heat. Divide the pasta into individual bowls or transfer into a large serving bowl. Garnish with the goat cheese and fried capers, drizzle with the lemon-infused oil and serve immediately. Here’s my favorite lemon-infused oil: O Meyer Lemon Olive Oil. Sweet, aromatic and subtle – it won’t overwhelm all the delicious flavors in this dish. Wow! Made this last night and we loved every flavorful bite! It was beautiful, delicious, and forgiving. I used the quantities I had on hand of zucchini, tomato and basil (less than recipe), kept the garlic at four cloves, and served sliced fresh mozzarella drizzled with a good olive oil on the side as my sweetheart doesn’t love goat cheese. The crispy fried capers were an unexpected delight! We raved about the flavor and freshness of this beautiful dish, and even this morning, I awoke thinking again about the lovely dinner we enjoyed. I will definitely make again and again! 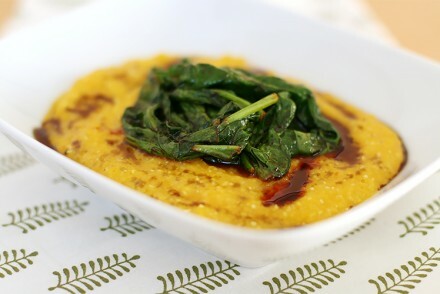 So simple and yet wonderfully flavorful! Thank you for sharing this recipe, and the video instruction was helpful!! I will follow you for additional recipes! The tomato Comte tart looks amazing and might be my next effort! Hi Cindy! Thank you so much for your wonderful comment – just made my day! You can try the recipe with ricotta (to replace the goat cheese). In fact I’ll update the recipe with this suggestion right now. Thank you again… and enjoy making this recipe all summer long! I made this tonight and it was simply perfect! A gorgeous presentation and such fantastic flavors. Thank you thank you thank you! Thank you so much for your note, Dee. I am smiling from ear to ear! We’re growing zucchini this year so this is a recipe I need to try. Thanks!!! We made this last night & it was sensational! this is the first recipe of yours I’ve tried and it makes me very excited to try more! The flavors in this dish are extraordinary. The combination of textures and tastes are addictive and I was glad I’d only made the two necessary portions as I would have gone for seconds. This is a new staple in my dinner choices. I’ve never understood buying the large jars of capers, but I do now. Yum. I used artisian pappardelle. I haven’t, but will, try your chickpea fettuccini. Your recipies have been delicious and I’ve barely scratched the surface. It takes great talent, a lot of work and tenacity to create innovative, balanced recipes along with giving all the necessary tools to replecate them. Your attention to detail and flavor profiles are a gift. I could always ‘cook’ quite well, but this is a higher, more refined level. This recipe is a wow! Highly recommended. Bonnie, I CANNOT thank you enough for your comment and kind words! You, my dear, are a gem… and a gift to me! A most heartfelt thank you. I am overjoyed you liked this pasta. I create new recipes on a weekly basis, but not all of them end up as delicious as this one. So it makes me really, really happy to know you loved it. Thank you again… and , as always, happy cooking! 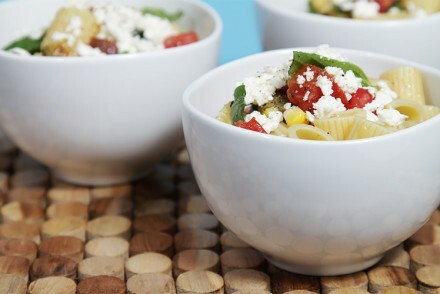 I’ve got lots of zucchini right now and this pasta is a wonderful way to enjoy all this summer goodness while it lasts. I adore the simplicity of the recipe, with wonderful flavor! Thank you, Deb! I so appreciate your kind words! 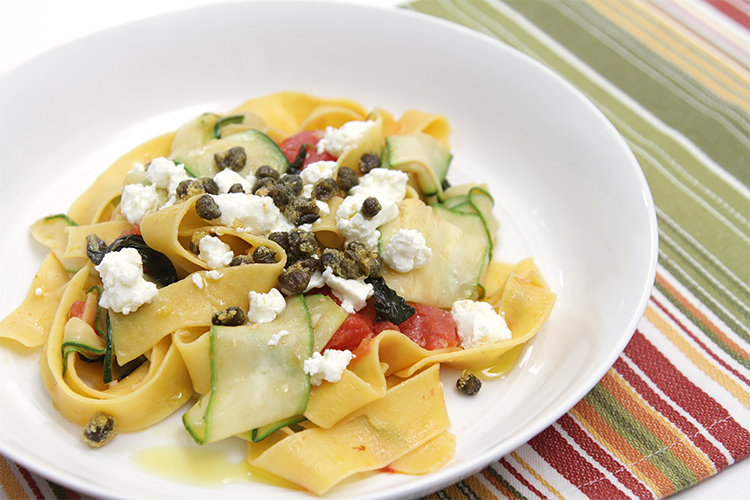 Love the mix of pasta ribbons with zucchini ribbons! And I’m going to have to try fried capers—they look amazing! What a lovely complex, but simple dish. Thanks so much for all the good food you have helped me make. You are most welcome, Madonna! Thank you so, so much for your note. WOW Viviane! What a beautiful pasta! I’ve never fried capers before so I know that’s something I need to try. A friend gave me jar of lemon infused olive oil that she brought back from Italy, so I know I’ll be making this! Thanks Viviane! Your dish looks absolutely mouthwatering! A perfect way to use up some of that zucchini in your garden! Lovely! Hi Kathy! Thank you so much… believe it or not, I lost my zucchini plants to powdery mildew this year – so sad! So I’ve been getting them at my farmers’ market. Great pasta dish. I have done zucchini ribbons as the pasta before but love the idea here to mix it with the pappardelle. Thank you, Evelyne! 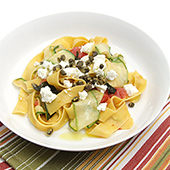 I love how the zucchini ribbons make this pasta so light… Perfect for the dogs days of summer! A homey and very delicious everyday pasta. Thanks for sharing, Viviane.